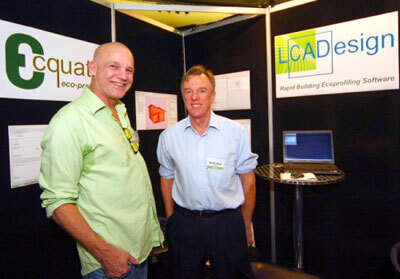 Construction Innovation recently featured LCADesign at the popular GreenTech 2008 in Sydney’s Convention and Exhibition Centre at Darling Harbour from 7 to 8 November. GreenTech combined a trade show with seminar sessions and additional special features including the Eco House of the Future Competition and 100% Green By Design, a national initiative for students studying Green Building, Design or Technology to showcase their new ideas or innovations. The Construction Innovation booth promoted the newly launched LCADesign eco-profiling software and enabled visitors to view demonstrations and discuss the potential time, money and environment-saving applications of the software. Delwyn Jones, former CRC project member and now manager of Ecquate Pty Ltd presented on Real-time Building/Product LCA. The trade show provided for more than 60 exhibitors from a diverse range of environmentally responsible companies including building services, alternative energy and green design choices.